The full name of Jacques Kallis is Jacques Henry Kallis who is born in the year 1975 October 16 at Pinelands, Cape Town, South Africa. 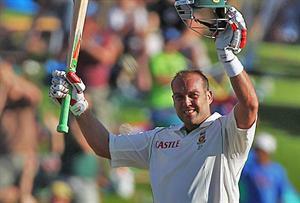 Jacques Kallis is the current No 1 test batsman of ICC cricket rankings with 883 points. Jacques Kallis is one of the best all rounders in International cricket. Jacques Kallis is one of the consistent batsman in South africa. As a all rounder Jacques Kallis is the only cricketer to score more than 10000 runs and 250 wickets in ODI and test format. Jacques Kallis started his International cricket career in the year 1995 December 1 where he played his first Test match against England. Kallis made his ODI debut in the year 1996 January 9 against England. As a child itself Kallis showed some amazing talents in cricket. His success period in cricket started in the year 1998 and became one of the best all rounders in those days. Kallis played an important role for south Africa to attain 1998 ICC champions trophy title, where he won two man of the matches award and Player of the tournament in the series. In the year 2000, Kallis played some important test innings against India which lead to a test series victory for south africa. With his amazing and consistent performance in the year 2000 and 2001, he became the No 1 Test All rounder in the world. Jacques Kallis holds the record of fastest fifty in test cricket from 24 balls. Kallis again showed his brilliant performances in the year 2007 where he scored 5 hundreds in 4 test matches. Apart from a batsman Kallis is an brilliant bowler where he had taken a total of 250 test wickets. In 2004 Kallis was awarded ICC player of the year. Kallis also showed some great performance in 2007 cricket world cup where Kallis is the top run scorer with 485 runs for South Africa. His amazing skills in both batting and bowling makes Jacques Kallis different from other cricketers in the world.